A year ago, my husband, parents and I made a dessert stop on Sawtelle Blvd in West Los Angeles to try Blockheads Shavery. As we walked around Sawtelle, we stopped to peek into a neighboring restaurant that I’d always been interested in. I drive by this area on a daily basis as I leave work and head home and I constantly see a line of people waiting outside this particular restaurant for a table. Of course, if it’s that popular, it must be good, right? As we strolled past the restaurant and took a look at the menu, my mouth started watering. If we hadn’t already had dessert, I might have suggested that we stop at the restaurant and eat instead. When we got home that evening, my husband and I looked at each other and said we’d go back to that restaurant one day and give it a try. It took almost a year, but we finally made it back to the restaurant. Tsujita LA Artisan Noodles is a ramen place at its core. With a very desirable corner lot, the restaurant is tiny, with a bar surrounding an open kitchen where you can watch the chefs prepare your meals along with a few smaller booths and tables to sit out and a tiny outdoor patio, the restaurant can’t accommodate the crowds of people that show up on a daily basis to dine here. Luckily, the service is quick and preparation of your ramen noodles isn’t time consuming, so they actually turnover tables fairly quickly. 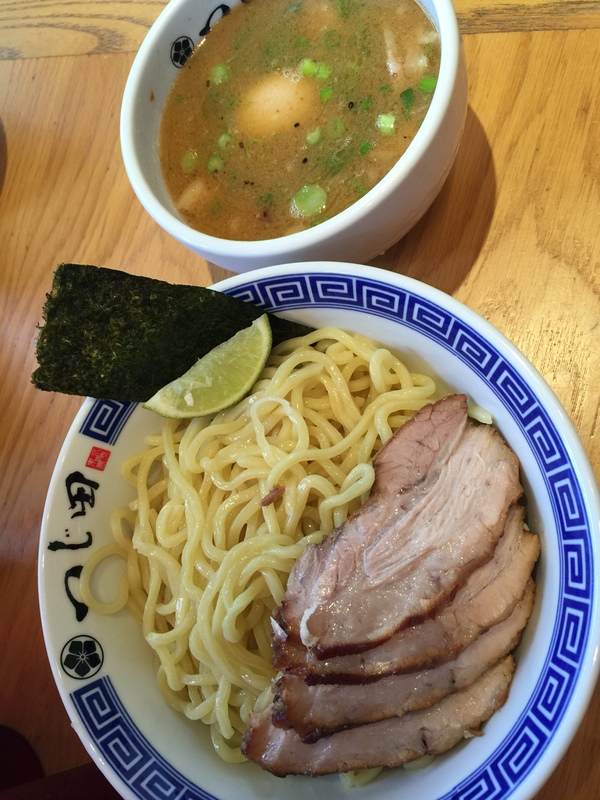 Opened in 2011, with its sister Annex shop opened a few years later, Tsujita LA is consistently mentioned by critics when you talk about the best ramen in the United States. In fact, Tsujita LA is an offshoot of Nidaime Tsujita, a Tokyo-based ramen house considered one of the best in Japan. 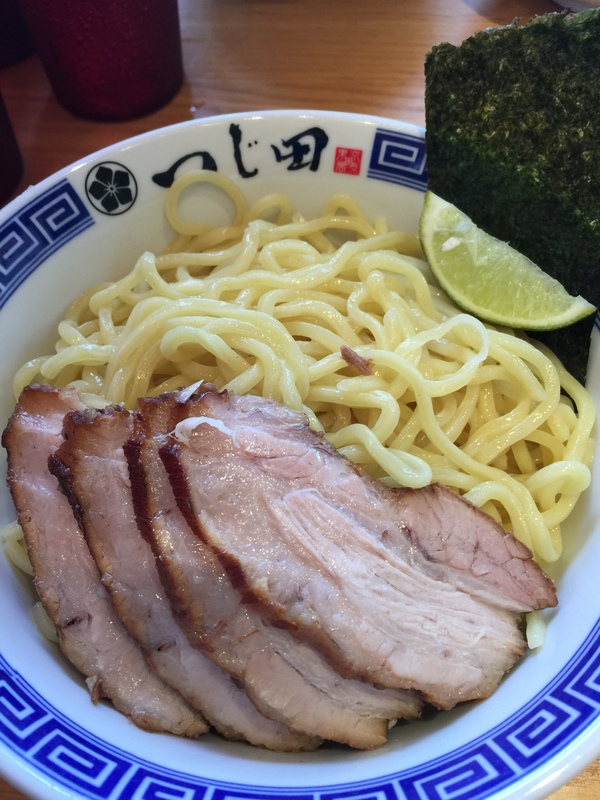 Tsujita is most known for its tsukemen, a different type of ramen noodle style, one I’d never seen before. Apparently, I’m not the only one who is unfamiliar with tsukemen and how to enjoy it. On the backside of the restaurant’s menu, there are instructions for “Tusijita tsukemen style” detailing a three step process used to enjoy the ramen noodles. Let’s back up first. What exactly is tsukemen? Tsukemen is a Tokyo-born dish featuring a super concentrated dipping sauce for your ramen noodles. The dipping sauce is made from reducing a fish-scented pork broth which is generally cooked for 12 hours or so. The ramen is served separately from the dipping sauce which makes it different from most ramen you know of where the ramen noodles are served in a bowl of broth to make a soup. After looking over our ramen options, my husband and I both ordered the char is tsukemen. Char siu just means bbq pork. With this dish, you get several slices of bbq pork served over your bowl of ramen noodles. The dipping sauce is the same for every tsukemen dish you order. 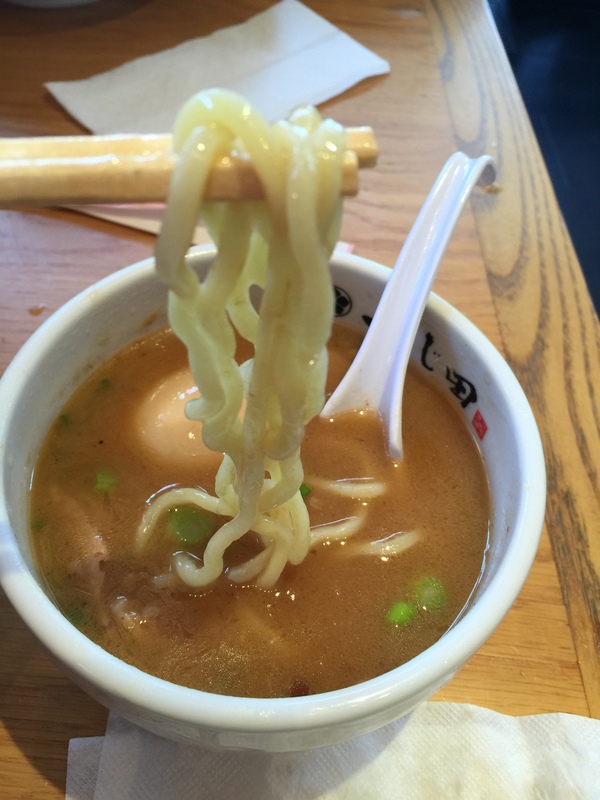 Your ramen noodles come in three different levels of doneness: hard, medium or soft. The restaurant recommends that you choose hard noodles, and we didn’t argue with that. Ultimately, my husband and I agree that it is the hard noodles that are the star of the dish. The fact that the noodles are soft, and flimsy and mushy the way overcooked ramen noodles can be. But the fact that they are hard, almost undercooked gives them a little bit of texture and bite to the dish, and allows them to really absorb the flavors of the dipping sauce. In the bowl of ramen, you’re also given a small wedge of lime and a piece of nori (dried seaweed). The “Tsujita tsukemen style” directions explain to you the three stages in which you’re supposed to enjoy your tsukemen. The first step is to begin by dipping the noodles in the soup broth. You dip, let it absorb some of the flavors, and then slurp it up into your mouth. Tsujita recommends that you enjoy about 1/3 of your bowl of noodles with this dip and slurp method. The dipping sauce is a super concentrated broth made with pork, with some tender of pieces of pork found inside the broth. You’ve also got a soft boiled egg, some scallions, definitely some sort of fish-scented flavoring, and some mushrooms. If you were to take a spoonful of just the broth, you can taste exactly how potent and concentrated it is. It’s not meant to be a broth that you just slurp up on its own. But it’s concentrated enough so that it can be absorbed by the ramen noodles when you dunk it in the dipping the sauce. The second part of the three step process is after you’ve finished about 1/3 to 1/2 of the ramen noodles, you should take the wedge of lime that comes in your ramen noodle bowl and squeeze the lime juice over the remainder of the ramen noodles. This changes the whole flavor of the experience. 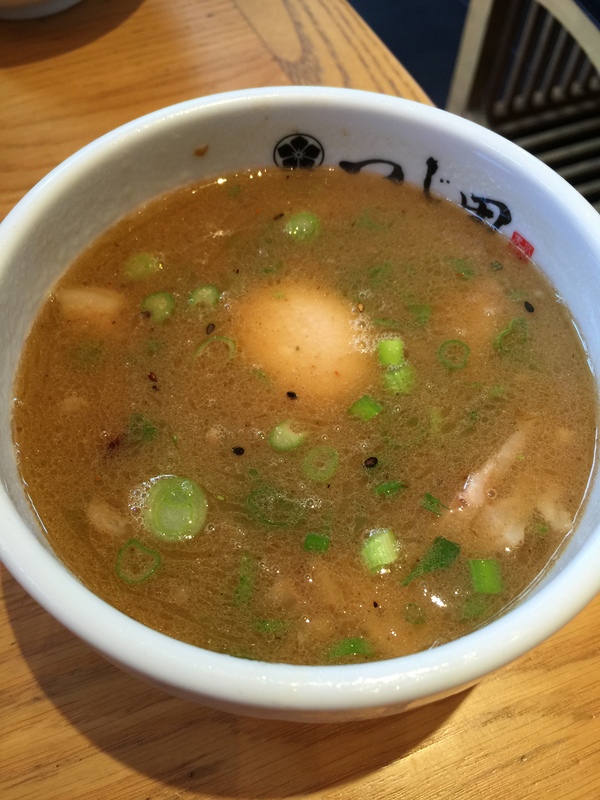 Something about the tang and tartness of the lime juice reacting with the savory broth when you dip the ramen into the broth really brings out different flavors to the dish. There’s that hint of tangy lime flavor and the acidity from the lime juice that is almost like having a completely different dish. You wouldn’t think that something as simple as lime juice could change the flavor of a dish, but it really transform it into a different experience. The last step comes when you’ve finished the ramen noodles. Presumably you have some dipping sauce left. As all you did was dip the ramen noodles in the bowl of dipping sauce, and you didn’t drink up the dipping sauce as a soup because it’s not, you should be left with 1/3 to 1/2 of a bowl of dipping sauce. The waiters will come around, if you want, and add soup stock to your dipping sauce. That soup stock will water down the concentrated flavor of the dipping sauce, creating a soup or broth that you can now enjoy as a soup. So, your dipping sauce basically becomes reincarnated again into something totally different and magical. That is, if you ever make it to this last step. It was amazing to my husband and I how filling one bowl of ramen noodles could be. We both arrived at Tsujita hungry and ready to eat. About 2/3 of the way through our respective bowls of ramen and char siu, we looked at each other and couldn’t figure out how we were both so full. You wouldn’t think that basic ramen noodles could fill you up, but they sit like lead weight in your tummy. And these aren’t the thin ramen noodles that come out of the package at home that you just boil, these are scratchy thick strands of ramen noodles. One bowl of this tsukemen is enough to fill you up for the day! 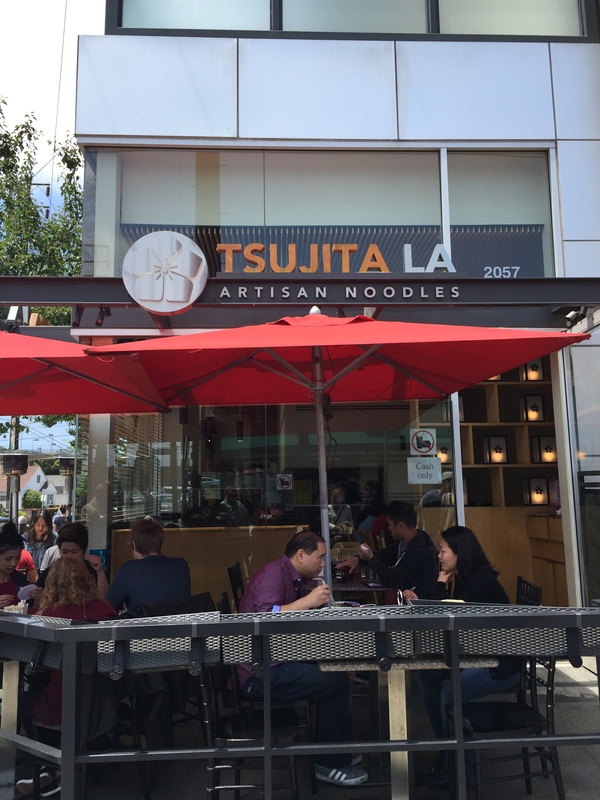 What an interesting and different experience Tsujita LA turned out to be. The experience of enjoying tsukemen was new, and fun, and best of all, delicious. The amazing dipping sauce is transformative. The flavors are strong and potent and rich, but go so well with the hard, almost undercooked, ramen noodles that make the perfect vessel for absorbing the rich dipping sauce. The dining experience is fun and interactive, almost. But the food is what will keep us coming back to Tsujita. I understand now why Tsujita is so popular and people line up waiting for a table. My husband and I have been back here since our first visit, and my husband has hinted again about going back. Guess he really enjoyed his tsukemen initiation!